I had the honour of talking quite a bit to Kim Choong-Wilkins, the amazingly talented man behind Bodybound. Despite his seemingly macabre designs - think 4" studs, leather and heavy knits, Kim Choong-Wilkins is actually an extremely extremely nice and down to earth bespectacled man. A graduate of Central Saint Martins and currently still based in London, Kim Choong-Wilkins is half Singaporean, and shares that he enjoys showing in Singapore as it feels like home. But London is still his permanent residence now as he knows where to find the right fabrics and where to buy good fur for his designs. He works together with a few of his staff, that are all constantly working towards the same vision and shares the same design aesthetic of his macabre, slightly gothic influenced clothes. I particularly like how his designs are raw in the sense that there is no attempt to prettify anything, nor is there any attempt to make them sophisticated - what you see is what you get. 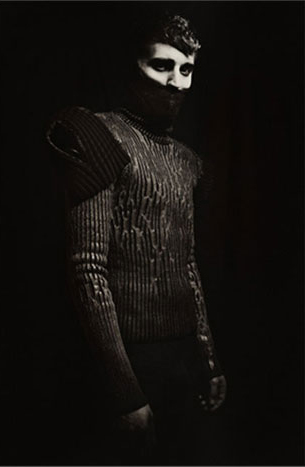 But at the same time, his designs are refined upon closer examination at the detailing that goes into each piece of knitwear and how they seem to pose as a second skin for the wearer, almost as though you would be able to peek into the dark depths of one's heart through his designs. 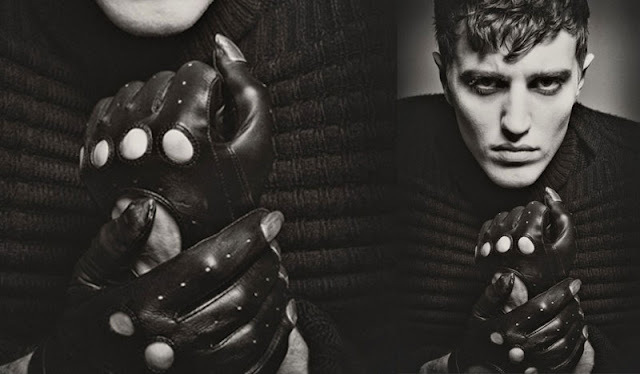 It is an interesting twist on knits - originally thought to be soft, warm and fuzzy - but now made seemingly morbid through the dark glistening threads, studs or pleather panels that is interlaced with the yarn. For your information, he makes everything himself. 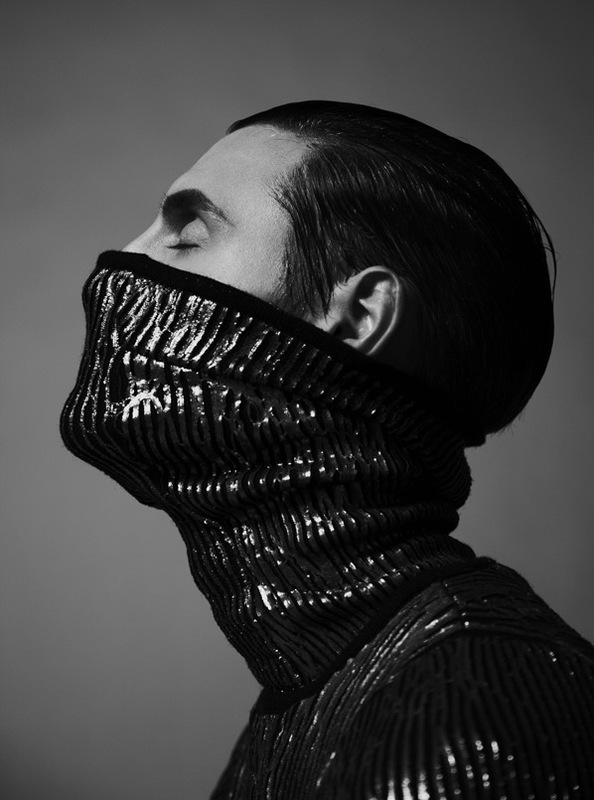 He designs those knitwear, threads those knits and he studs them single-handedly. It is undeniable that Kim is extremely immersed in his design process and possesses a clear design aesthetic for his brand. "I don't wanna spend 2 hours making say, a Gucci cashmere sweater that can be retailed for 200euros. I'd rather spend days and weeks, pain, blood, sweat and tears making a sweater like this," he says as he gestures towards one of his designs. He does not alter his designs or his vision simply to commercialize his clothes, but instead is bold at pushing at the boundaries of menswear to explore options other than suits, blazers and shirts. If one doesn't like his designs, one can simply choose not to wear them. For me, Kim joins the ranks of designers such as Rick Owens, Ann Deulemeester and Vivienne Westwood to design for a specific clientele that shares their aesthetic. Followers of their designs should be able to recognize each other while walking in the streets like how emo kids recognize each other. I think what you put onto your body should be like that. It should not simply fulfill the the idea that you look good, but it should be a reflection of your personality and style - it is a tool to break out of mediocrity. For Spring Summer 12, Kim is looking at the idea the corporates pounding the pavements of gritty urban streets. "When we think of athletes, it's clear that they are competing against one another. But I want to look at how the man in the street competes against each other as well. The first to get on a bus, the first to queue at a restaurant, the first to submit a piece of work...I wanna bring that to my designs to create something more wearable but at the same time retaining my own brand identity." 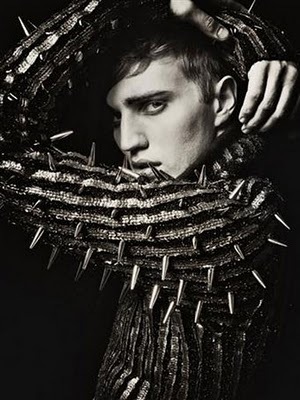 I'd say I can't think of anything sexier than a London man riding a bike along the road and wearing one of his studded sweaters. heya vera, rice here! why dont u share this on our bodybound fb wall like the rest? totally welcome to do its a cool post! :D cheers n see you around!